This is old news for some .. but I don't want anyone to forget this important Ufo case, thus why i am re-visiting it with this post. An interesting Admission from the US Airforce back from 1952 in which they admit 20% Ufo sightings can not be discounted for. 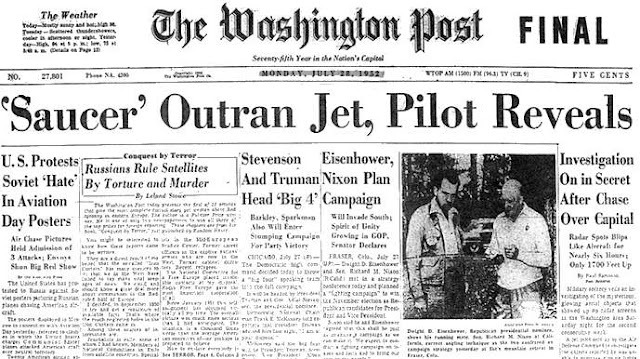 This press release was an unprecdented response to the famous 1952 Ufo fleet that flew over washington and scared the hell out of the US government. Sadly, (or conveniently) many people seem to have forgotten about this important Ufo event and so i highly suggest you read up on this case if you haven't already. "However, there have remained a percentage of this total [of all UFO reports received by the Air Force], about 20 per cent of the reports, that have come from credible observers of relatively incredible things. We keep on being concerned about them." Following the Unidentified Flying Objects over Washington D.C. A few nights of intense activity over Washington, D.C. On July 19/20, July 26/27 the skies above the nation's capital were crowded with UFOs darting here and there, over the White House, over the Capitol Building, over the Pentagon. Tracked on radar and visual sightings from the ground. Jet fighters was also scrambled to investigate the UFOs, the jets were outclassed by the speed of the objects. The sightings continued 3 days after this press conference on the nights of August 2/3 - With no real answers from the Government to the mystery. continue reading up on it here. Was this case an example of how the US mucked up first contact back in 1952 ? Ufologist argue the 1952 incident was a response by ET's to engage first contact triggered by both the 1947 Roswell incident and concerns about nuclear weapons testing and proliferation in the early 40's in preparation for WWII. You comments appreciated on this theory. Note: Unlike other photos on the web this image is not part of a photo from a CGi recreation of the event - it is infact a real Photo of triangular formation UFO fleets seen directly over the whitehouse in 1952 - photo taken by the washington Post. It's got to be either "cannot be accounted for" or "cannot be discounted". That's actually the Capitol Building, not the White House. Does anybody know where that film of UFOs flying over the Capitol Building came from? Did it come from a news service, Hollywood studio, etc?